Last Wednesday (25th Jan) we launched our new “Modern Day Wisdom” event series, which sees us teaming up with General Assembly and calling on kickass panellists to share their experiences in a ‘Have I Got News for You’ meets TechCrunch meets Davos format (bear with us…) Our first (and sold out) event: “women slaying the tech world”. 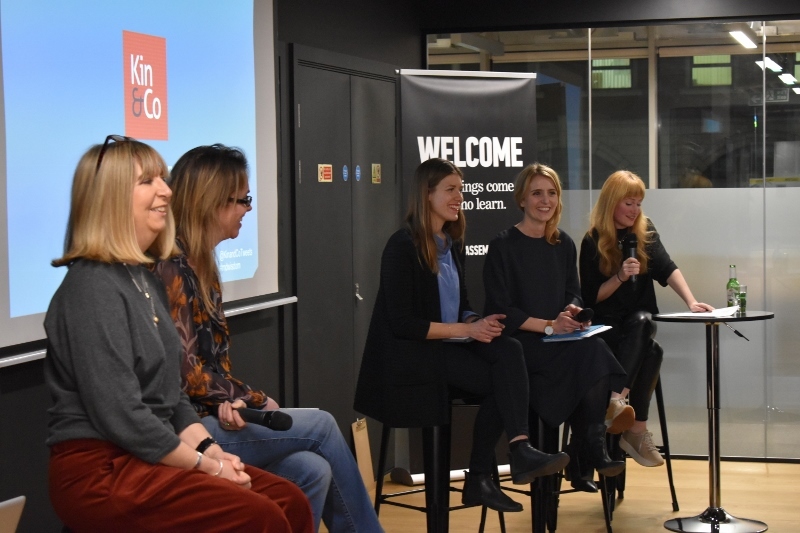 Our victims – panelists – included some of the biggest names in the tech world: Jess Taylor, HR at Not on the High Street, founder of Geek Girl Magdalena Krön, Olio founder Tessa Cooke and our very own chair and former CEO of White Stuff, Sally Bailey. And what an audience they attracted with all 320 tickets sold out, and a lengthy wait list, the room was at capacity! Moderated by our CEO Rosie Warin, our incredible panellists were thrown into a battle of wills in an event format which no one in the audience – or on the stage – had experienced before. Why did we bother mixing things up? We attend a lot of networking events and were keen to take a little risk, try something a little different and take a light-hearted approach to something that is all about making genuine connections with seriously interesting and inspirational people. Each panellist was asked to share their experience in a series of increasingly ridiculous game show rounds. It’s amazing the depth of wisdom that can be imparted whilst clutching a squeaky rubber chicken – hat tip to you, Tessa! We learnt Magdalena used to work in a chocolate factory, Sally was turned down for a job because she is a veggie, FHM sells better when the models are wearing red bikinis on the cover (excellent regression analysis insight from Tessa) and that Jess learnt some of her biggest leadership lessons whilst working on a Pot Noodle production line. BUT our absolute highlight of the evening was the bluffer round; Jess from NOTHS managed to say ‘Buckaroo’ three times without being noticed. A bloody miracle! So onwards and upwards for our next event in March. You can follow the event series on the GA website here, drop an email to info@kinandco.com to be added to our mailing list or watch this space for updates!